The aerodrom in Male is on its own island. Male is the only town on the Maldives Islands. 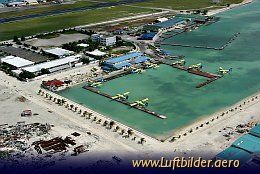 From here tourists are transported per waterplane or traditional Dhoni to their holiday paradise.